Web analytics is not only our bread and butter, but our passion as well. Our blog content delivers solid proof of that. Or at least we think so ;-). This year, in more than 70 articles, we have covered the latest data privacy regulations, as well as shared our knowledge on Piwik PRO best practices, tips and tricks for conversion optimization, and many other topics related to web analytics. In case you missed out on some of our guides, comparisons, checklists or infographics, we’ve prepared a compilation of the 10 most-read blog entries from 2016. Read on to get to know them all! Due to its high quality insights, JS Tracking has become the standard web tracking method, with nearly 90% market share. However, for a number of reasons, this solution may not be suitable for everyone. And this is typically where Web Log Analytics – the most popular alternative to JS – comes in handy. Being more security- and privacy-oriented, web logs allow you to collect web server log files and import them to your analytics viewing platform without the necessity of changing a single line of code on your website. Unfortunately, the two methods of collecting data differ in many ways – even in the numbers they provide you with. Your choice should therefore be based on your particular needs and requirements. Learn which choice – JS Tracking or Web Log Analytics – is the right one for your business. Sampling is a statistical technique in which you draw conclusions based on a portion of data, not the complete data set. As it drastically shortens the time spent on collecting information and still brings somewhat representative results, this method is broadly used in research studies and opinion polls. Unfortunately, what works perfectly fine for testing and measurement companies may not be good enough in web analytics. Since you cannot be 100% sure if your analytical tool is displaying all of the meaningful trends and insights, the usefulness of sample-based traffic reports is rather disputable. What’s interesting is that most analytical tools – including Google Analytics – use data sampling anyway. Read on if you want to know more about why data sampling may be bad for you. In its 10 years of existence Google Analytics has become the default web analytics tool for 8.5 of 10 website owners. The reasons are quite obvious – it’s easy to use, accessible for every Gmail account owner, and free of charge. However, there are numerous cases in which you might consider using an alternative web analytics solution, especially when you don’t feel comfortable with sharing your data with anyone else. 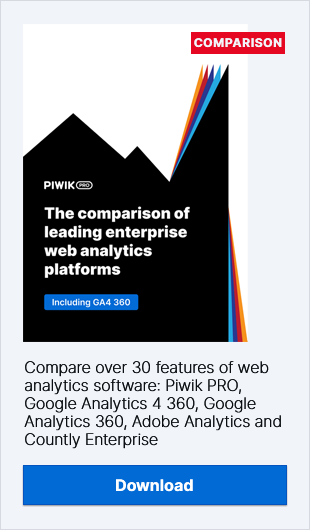 Read our Whitepaper to find out which solution – Google Analytics or Piwik PRO – suits you best. Step 3: Consider the best courses of action. Sounds interesting? Read the whole blog entry to learn how to turn your ecommerce struggles into success. Web analytics is a powerful tool. If it’s used correctly, it provides you with insightful information and helps you to make decisions based on solid data and not just your intuition. On the other hand, when contaminated with misrepresentation of facts, it leads you to bad choices and far worse outcomes. Even if everything looks plausible at first sight! Protect your analytics insights from the curse of damaged data – avoid things like referral spam, data sampling or default usage of third-party cookies, along with many other possible dangers. Learn how to recognize those problems and how to overcome them once and for all. Aggregated data is a pool of information – and you can easily drown in it! Fortunately, with a little help from Custom Dimensions and Custom Variables you have the chance to put your reports in the proper context and obtain practical knowledge about both your visitors and the actions they’re performing on your website. Those valuable features come out-of-the-box with Piwik PRO. Put them to work and gain a better understanding of your customer journey. Want to learn how? Let us show you 3 actionable use cases of Custom Dimensions and Custom Variables you can easily implement in your business. Web Analytics Vendors Review & Comparison Sheet: Which Solution Will Be Right For You? Unfortunately, when it comes to web analytics there is no one-size-fits-all solution. Especially for enterprise-level organizations with tough demands and unique needs. Also, you have to keep in mind that every tool offers different functionalities and has its unique advantages. Since web analytics is a long-term project for every organization, you have to know exactly what you’re investing in. Are you wondering what sort of things you should consider during the decision process? Then read our overview of 5 the most popular web analytics vendors and forget about those which don’t meet your requirements. As it combines many different fields, skills and responsibilities, web analytics may be a real challenge not only for novices, but even for those with extensive experience working with data. Without a proper plan you will find it difficult to prioritize what issues you need to take care of. And you can easily get lost in the confusion of legal regulations, old logs, referrer spam, and tool integrations. Are you wondering where to begin in dealing with all those tasks? Fortunately, you don’t have to start from the ground up. To make your work simpler and less nerve-wracking we’ve prepared 4 actionable analytics checklists to use whenever you need them. SaaS, IaaS, PaaS… If you’re at the stage of choosing a delivery model for your web analytics solution, you are probably familiar with those mysterious-sounding terms. What you may not know is that the digital set-up type you end up with will have a huge impact not only on the type of infrastructure you’ll be using, but also on your data privacy liability. And since web analytics tools collect massive volumes of sensitive information, protecting your users’ data is quite a big deal. Read our comparison of web analytics delivery models and determine which solution will suit you best. With more than 1.35 billion potential customers and the second largest economy in the world, China may seem a great place to start a business. Unfortunately, the country is also infamous for its legal restrictions that can easily clip your wings. Especially if you work for an online company highly dependent on web analytics. As Google Analytics is no longer allowed to operate in China, you may come across latency or even time-out problems when trying to connect with it. And if web analytics is critical for your organization, issues of that sort could be not only troubling, but costly as well. Learn how to overcome the great firewall and restore data accuracy to your web analytics. New Year – New Blog Posts Coming Up! As you can see, this passing year has brought us many changes and developments in the field of web analytics and data privacy. We assume that the forthcoming year will be no different, so stay tuned for even more Piwik PRO blog entries, infographics and whitepapers in 2017! Best Holiday Wishes From Piwik PRO Team!